A must read for everyone. It has made me rethink what we expect from our "Quiet" students. I greatly enjoyed Susan Cain's writing. 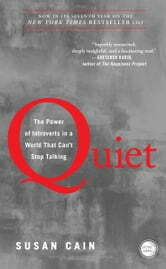 She provides a lot of excellent points and facts about being introverted and extroverted. As an introvert, I agree with the fact that everyone's constantly pushed to have an extroverted exterior or to hide the fact that you're in introvert. She goes into great detail about this while continuing to express just how important and valuable introverts are. Awesome book! This book taught me very much about myself and others i interact with. Very enlightening and encouraging. For all of you extroverts that sometimes wonder why I do the things I do - read this book and all will be explained. But then, if you're an extrovert, you'd probably rather be socializing than reading. This book was so affirming in many ways. I liked how she recognizes introvert leadership in particular. Thank you for this book Susan Cain. Maybe the current "shy" kids can now be just reserved, quiet, sensitive, whatever, instead of having a shaming label of shy placed on them.